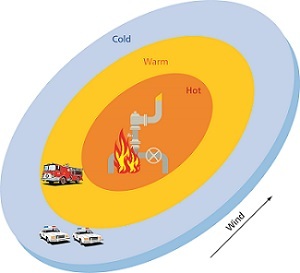 In the United States there are over 5,300 miles of CO2 pipelines, and while pipeline leaks are exceedingly rare, it is important that emergency responders be familiar with response tactics should a CO2 incident occur. On the way to the scene of a suspected CO2 pipeline leak, first responders should review any maps they have from the operator displaying the pipeline system. These maps may include critical information such as the start location, product and quantity of product transported, isolation valve placement, and termination points. Maps for pipelines located in counties and parishes in which Denbury operates are available to emergency responders by emailing aware@denbury.com. First responders should always arrive on-scene with appropriate personal protective equipment (PPE), including turnout gear, mask and a self-contained breathing apparatus (SCBA). Wearing a SCBA is an important precaution when dealing with CO2, as there is risk of CO2 displacing oxygen in the area. Once at the scene, the area must be quickly evacuated and non-essential personnel should be instructed to stay away from the hazard area. One of the first priorities should be to establish hot, warm and cold zones, a decontamination zone, and medical evaluation areas. If there are injuries at the scene, responders should not attempt to assess a patient’s vitals in a hazardous atmosphere. The patient should be evacuated as quickly as possible to the cold zone or medical evaluation area for an examination. During the response it is critical that oxygen gas detectors such as an “MSA” or “QRAE” devices are used to monitor the amount of oxygen in the atmosphere. CO2 has a density of nearly 1.5 times greater than oxygen, meaning it will congregate in confined spaces close to the ground, so proper ventilation is the most important mediation tactic that can be performed at the site of a CO2 incident. This can be done by using positive pressure ventilation (PPV) systems found on fire trucks, or booster fans to aid in ventilating the area. When preparing to leave the “hot zone” and enter the decontamination zone, always ensure that an oxygen deficient atmosphere does not exist prior to removing your PPE and SCBA. If you have any questions on responding to CO2 Pipeline Leak, please email aware@denbury.com for more information. 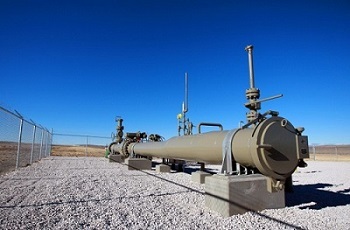 Carbon Dioxide (CO2) is a key product used in the enhanced oil recovery process, and Denbury Resources’ CO2 pipelines are built to transport the product from producers to delivery locations, where it is used to aid in the extraction of oil from existing well sites. The construction of carbon dioxide pipelines is a methodical process that is accomplished in a series of specific steps. Extensive planning is conducted prior to construction of a carbon dioxide pipeline. The size of the pipeline is determined by the capacity needs in the area and the route is chosen after thorough environmental, historical, and archeological studies are completed. Landowners are contacted and easements are obtained as survey work begins. Once the route is finalized, it is staked and flagged by surveyor crews. After marking of the designated route, the new right-of-way is cleared and a temporary construction working area established. Pipe and equipment lay down yards are selected along the route. During the clearing phase, any earth moving required for construction is conducted and significant attention is focused on sediment and erosion control. During the construction phase, the trench for the pipeline is excavated and the sections of steel pipeline are strung along the right-of-way in preparation for welding. Bends in the pipe to accommodate changes in topography may be conducted in the field by bending machines or prior to delivery at the pipe mills. Certified welders join the pipeline sections and associated valves prior to the pipeline being lowered into the trench. Welds are x-rayed to ensure integrity and the coating on the pipe is thoroughly inspected to ensure there are no defects or construction related blemishes that could later lead to corrosion. Once the pipeline is properly prepared, it is carefully lowered into the trench which is later covered with back fill material. After the pipeline has been successfully installed in the right-of-way, extensive ground restoration activities are conducted. This includes installation of sediment and erosion control measures such as silt fences and hay bales. The right-of-way is seeded and regularly inspected to ensure proper revegetation. Testing of the pipeline is conducted to ensure integrity. In some cases, the pipeline is filled with water and pressure tested beyond the maximum operating range to verity integrity. In other cases, an intelligent inspection tool, referred to as a “smart pig” made slightly narrower than the pipeline is inserted and pushed through the line using product to assess the condition and to detect any construction related defects. Denbury Resources considers safety to be our top priority and that includes the construction and operations of our pipelines. Our highly trained and experienced staff is committed to ensuring that we make the safety of the public, our employees, and the environment our primary goal every day! CO2 from Industrial Sources – what are the benefits and what is it used for? While it has been utilized safely since the early 1970s, the use of carbon dioxide (CO2) to assist in recovering oil from mature or depleted fields has recently become more common in the United States. In fact, more U.S. operators rely on CO2 injection for enhanced oil recovery (EOR) than any other method. A recent Oil and Gas Journal survey of EOR activities showed more than 120 such projects in the nation, helping to produce more than 250,000 barrels of oil per day. Nationally, the Department of Energy estimates that of 400 billion “stranded” barrels in place, more than 84 billion barrels of oil in existing U.S. oil fields could be recovered using CO2. In most U.S. oil fields, about one-third (33 percent) of the original oil in-place is recoverable through primary and secondary recovery methods, increasing to 50-60 percent with the use of CO2 in the process. Using CO2, rather that other means for recovery such as nitrogen or natural gas, makes oil more mobile, significantly increasing the amount of crude recovery, and providing environmental benefits. CO2 generally originates from one of two sources – naturally occurring and “industrial” CO2 that is generated through human activity. Primary natural CO2 sources include ocean release, animal and plant respiration, organic matter decomposition, forest fires, and volcanic eruptions. Industrial CO2 sources include fossil fuel burning, farmland plowing -- where soil is exposed to air, bacteria within the soil breaks down the organic matter, releasing CO2 in the process -- and the use of limestone to make cement. The process of capturing industrial source CO2 from facilities such as power plants puts the product in a transportable state. In the last two years, Denbury Resources began purchasing and utilizing industrial source CO2 from industrial facilities which capture, purify, dry and compress it for delivery into the company’s pipeline network. These lines then move the CO2 to production areas where it is used in the recovery process. Using industrial source CO2, not only increases crude recovery, but reduces the total amount of CO2 required in the entire production process, resulting in lower emissions. Enhanced oil recovery and the ability to redevelop older, depleting oil fields is a way for the nation to tap once unobtainable reserves and to continue to make America more energy independent. For more information on Denbury’s EOR process, please click here. 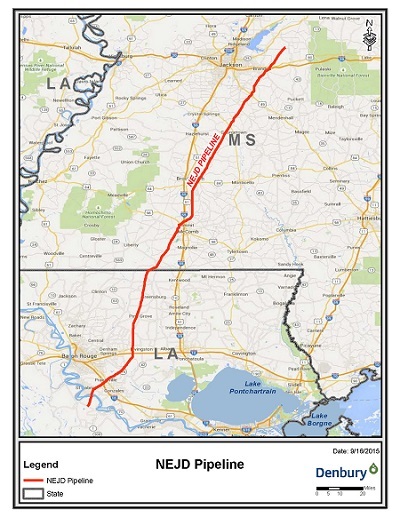 The Northeast Jackson Dome Pipeline (NEJD) is a 183 mile CO2 pipeline stretching from eastern Louisiana to the Jackson Dome region of central Mississippi. Denbury Resources acquired this pipeline in 2001, and it is an important piece of the 950 miles of CO2 pipelines we use to deliver CO2 in the Gulf Coast region. Some of Denbury Resources’ longest CO2 producing properties are located in this region, and are supported by the 20-inch NEJD pipeline operating at pressure up to 2220 psi, but normally around 1250 psi. These properties include our first CO2 field, known as Little Creek, as well as Brookhaven, Lockhart, Mallalieu, McComb, Olive, and Smithdale fields. The Northeast Jackson Dome pipeline allows Denbury to serve as a reliable source for CO2 at a reasonable and predictable cost for the Gulf Coast region. For more information on NEJD and pipelines in the Gulf Coast, please go to http://www.denbury.com/operations/gulf-coast-region/Pipelines/default.aspx . Emergency responders may request pipeline county maps from Denbury by sending an email to aware@denbury.com.